Roosevelt lashes out against lying political attacks, calling for honesty and sanity in public discourse. In Bunyan's Pilgrim's Progress you may recall the description of the Man with the Muck Rake, the man who could look no way but downward, with the muck rake in his hand; who was offered a celestial crown for his muck rake, but who would neither look up nor regard the crown he was offered, but continued to rake to himself the filth of the floor. In Pilgrim's Progress the Man with the Muck Rake is set forth as the example of him whose vision is fixed on carnal instead of spiritual things. Yet he also typifies the man who in this life consistently refuses to see aught that is lofty, and fixes his eyes with solemn intentness only on that which is vile and debasing. One of the chief counts against those who make indiscriminate assault upon men in business or men in public life is that they invite a reaction which is sure to tell powerfully in favor of the unscrupulous scoundrel who really ought to be attacked, who ought to be exposed, who ought, if possible, to be put in the penitentiary. If Aristides is praised overmuch as just, people get tired of hearing it; and overcensure of the unjust finally and from similar reasons results in their favor. At this moment we are passing through a period of great unrest -- social, political, and industrial unrest. It is of the utmost importance for our future that this should prove to be not the unrest of mere rebelliousness against life, of mere dissatisfaction with the inevitable inequality of conditions, but the unrest of a resolute and eager ambition to secure the betterment of the individual and the nation. As a matter of personal conviction, and without pretending to discuss the details or formulate the system, I feel that we shall ultimately have to consider the adoption of some such scheme as that of a progressive tax on all fortunes, beyond a certain amount, either given in life or devised or bequeathed upon death to any individual -- a tax so framed as to put it out of the power of the owner of one of these enormous fortunes to hand on more than a certain amount to any one individual; the tax of course, to be imposed by the national and not the state government. Such taxation should, of course, be aimed merely at the inheritance or transmission in their entirety of those fortunes swollen beyond all healthy limits. Again, the national government must in some form exercise supervision over corporations engaged in interstate business -- and all large corporations engaged in interstate business -- whether by license or otherwise, so as to permit us to deal with the far reaching evils of overcapitalization. On the other hand, the wild preachers of unrest and discontent, the wild agitators against the entire existing order, the men who act crookedly, whether because of sinister design or from mere puzzle headedness, the men who preach destruction without proposing any substitute for what they intend to destroy, or who propose a substitute which would be far worse than the existing evils -- all these men are the most dangerous opponents of real reform. If they get their way they will lead the people into a deeper pit than any into which they could fall under the present system. If they fail to get their way they will still do incalculable harm by provoking the kind of reaction which in its revolt against the senseless evil of their teaching would enthrone more securely than ever the evils which their misguided followers believe they are attacking. Text of speech courtesy of the Program in Presidential Rhetoric, Texas A&M University. TR calls on Americans to participate in political life. The American foreign policy statement that provided the basis for Roosevelt's military intervention in Latin America. 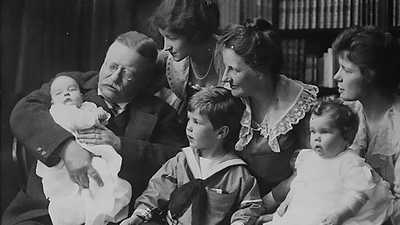 Read some of Theodore Roosevelt's letters to his children.